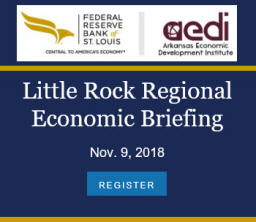 The latest monthly report on employment and unemployment in Arkansas was a fairly strong report. 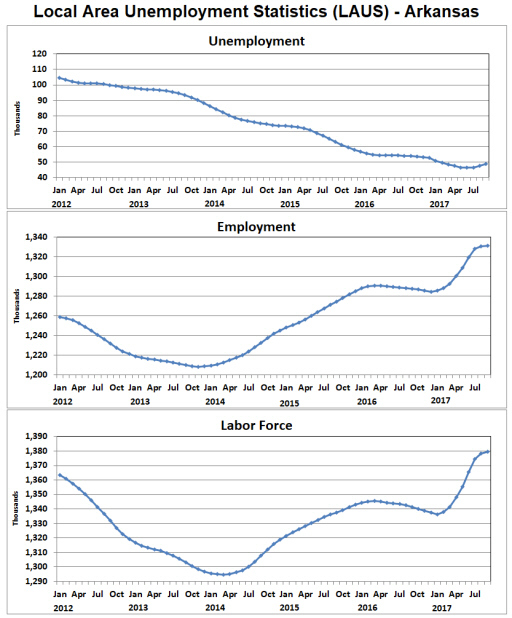 Both the household and payroll surveys showed employment gains for the month. And while the number of unemployed was up for a third consecutive month, the unemployment rate was unchanged at the very low level of 3.5%. 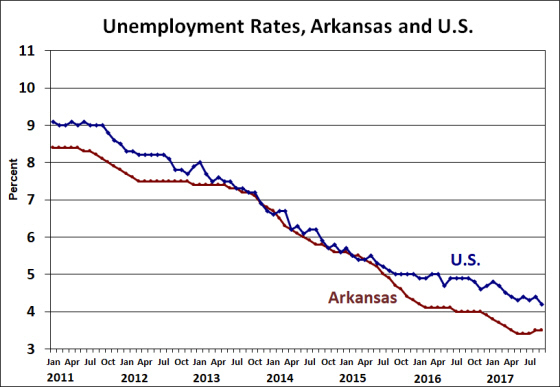 The U.S. unemployment rate dropped 0.2% to 4.2% in September, remaining significantly higher than the Arkansas rate. The increase in the number of unemployed over the past three months has totaled about 2,300, but this increase has not significantly affected the unemployment rate, which has held steady as the number of labor market participants has grown proportionately. Over the past 12 months, the labor force has grown by over 43,000, with most of that increase occurring in the first six months of 2016. While we expect that figure to be eventually revised downward, the positive momentum is clear. Data from the establishment survey reinforces the evidence of solid employment growth. 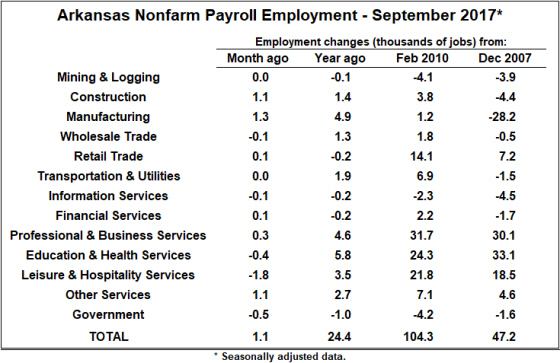 Arkansas nonfarm payroll employment was up 1,100 in September, and the figure for August was revised upward by 1,600 jobs. September is a month with significant seasonal influences: The not-seasonally adjusted statistics showed an employment increase of 15,500, but most of those gains were in State and Local government (public schools) and Education Services (private institutions). The seasonally adjusted figures in the table below adjust for these predictable patterns. Goods producing sectors performed well in September, with Construction up 1,100 and Manufacturing up 1,300. The seasonally adjusted statistics actually show a decline in total service-providing employment, with losses particularly evident in Leisure and Hospitality sectors. 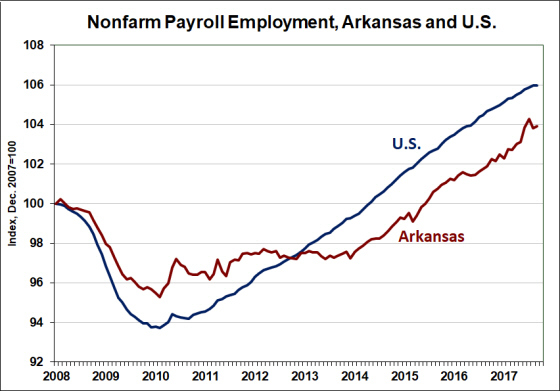 Compared to a September 2016, total nonfarm payroll employment is up 24,400 jobs in Arkansas — a rate of 2.0%. Over the same period, nationwide employment has expanded by 1.2%.